Beneath this demeanor belied a very loving child- at least when it came to her own parents. She knew she had nothing of her own because they possessed so little. Her father seemed to have the mind of getting a job, completing a job and keeping flying, rather than sowing any lasting investments. Until her exposure to the Brotherhood in [[30 ABY to 39 ABY|35 ABY]], she showed little more than an natural aptitude for mathematics and music. Upon her Master's return, Lav'anre began to feel a wanderlust. She had so long grown used to the wandering of her youth that she became unable to remain upon [[Sepros]]. Though she did not express these feelings to Bentre, he seemed to understand her need. He ordered her to train on Tarthos. The girl's arrival on the planet coincided with the orchestrated purge of so-called ''disloyal'' forces. Unlike her master, Lav'anre saw an odd sort of wisdom to the actions orchestrated by the Ragnosian Quaestor. While she refused to pledge herself to [[Kojiro Keibatsu]], she joined in on the purges. The true proving ground for Lav'anre was at [[Rite of Supremacy: Meridian|Meridian]] in [[30 ABY to 39 ABY#36 ABY|36 ABY]]. As her master took on the reins of the Clan leadership, the girl found that her training grew more and more strained. Less time was devoted to training her, when instead her efforts could be directed toward the support of the Clan. This left the girl somewhat separated from the mainstay of the Sadowan efforts at the Collective's space station. While she found herself caught up in the final actions before the Brotherhood's victory, it was not without casualties. For her bravery despite the breadth of her fear and her own inexperience, Stahoes believed she had been tested by the forge of battle, and had been found satisfactory. 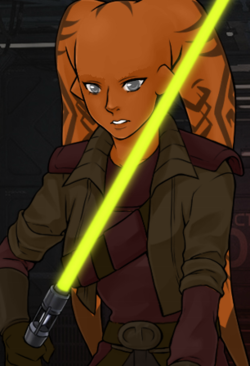 She was presented with a [https://www.darkjedibrotherhood.com/admin/items/38320-novitiate-armory-lightsaber lightsaber to call her own] and elevated to Knight upon her return. The elevation was with less pomp and circumstance than she had seen showered upon lesser students. Yet, she was given a freedom of reign on how she would continue. Taking the opportunity, the former apprentice requested a chance to act as eyes to the Brotherhood. No longer a mere student, she would serve the interests of the Clan, more as a soldier and scout than a typical Disciple of Sadow. Soon after her ascension, the Consul took up the stewardship of another student. She was no longer so tightly bound to her master. She was the master of her own fate. Both parents are deceased. There is no relevant data upon either individual recovered from the wreckage of the ship, and the child has refused to comment during any interview on the nature of their relationship. Of particular interest to those interviewing her, the Twi'lek has chosen to bear no family name, nor any name beyond that which was given to her upon her birth. Though she considers herself a disciple of Clan Naga Sadow, she does not consider herself beholden to any family or clan. She is a family of one. The woman seems to hold her 'master' in cold disregard. She learns from the man readily enough, but she possesses nothing like appreciation or gratitude for his acts. It can be assumed that she sees him as little more than a tool. It has been speculated by Stahoes himself that she may just be hurting from the recent loss of her family. Despite his relatively understanding nature, her Master has worked to reel the girl in so she might better serve the cause of Sadow. She has begun to resent his actions over time, but keeps her tongue most times when in the man's presence. The Twi'lek also recognizes that there is still something to be learned from the man, if she can only keep herself alive and well. As her master stepped up to the office of Consul, she found- to her annoyance- that his attentions were spread out to a greater degree. She determined she would have to work harder to keep the man's attention. After all, she reasoned to herself, wasn't having the Consul's ear tilted toward you the quickest path to power? While still markedly detached, Lav'anre has actually connected somewhat with her master's wife. There is a connection between the two that is warm, almost as though the young woman views Tasha'Vel as some sort of surrogate mother figure. This warmth does not translate into the training that occurs with the two in a student-mentor fashion, however. There is still a cool almost-disinterest that flows from the younger girl toward her elder. While she may hold Tasha'Vel in higher regard, she does not consider herself a member of their family and has expressed no interest in such a relationship with the family. Instead, she has chosen to continue holding no name but her own.